Eric D. Donnenfeld, MD, is selected to be the first cataract surgeon in the country to launch EyePoint Pharmaceutical’s FDA-approved DEXYCU (dexamethasone intraocular suspension) 9% to improve post-operative cataract surgery patient compliance. The historic surgery took place at Island Eye Surgicenter in Westbury, Long Island. Tom Burke, CEO of Spectrum Vision Partners states, "Spectrum Vision Partners is proud to continue its collaboration with national leaders who bring the latest innovations in advanced cataract surgery to their patients... Dr. Donnenfeld, the OCLI vision experts and the Island Eye Surgicenter team." 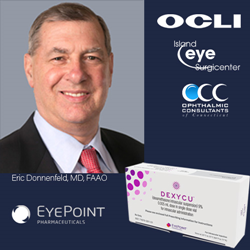 Eric D. Donnenfeld, MD of Ophthalmic Consultants of Long Island (“OCLI”), Ophthalmic Consultants of Connecticut (“OCC”), Spectrum Vision Partners (“SVP”) managed practices, often sought for his expertise and innovation in the field of Ophthalmology, has successfully performed the first Cataract Surgery in the United States, utilizing FDA approved DEXYCU™ (dexamethasone intraocular suspension) 9%, at Island Eye Surgicenter in Westbury, NY. EyePoint Pharmaceuticals, Inc. is a specialty biopharmaceutical company committed to developing and commercializing innovative ophthalmic products, announced yesterday that it has commercially launched DEXYCU™ (dexamethasone intraocular suspension) 9% in the United States. DEXYCU is the first and only U.S. Food and Drug Administration (FDA) approved intraocular steroid for the treatment of postoperative inflammation and is administered as a single dose at the end of cataract surgery. DEXYCU is intended to replace the use of steroid eye drops which have a dosing regimen that, depending on the brand, can require self-administration for up to four times a day and titrating down over four weeks. This complicated dosing regimen can often lead to poor patient compliance. The launch of DEXYCU will be phased, with the initial phase being to leading cataract surgery experts such as Dr. Donnenfeld, to ensure proper training on DEXYCU’s administration ahead of its wider availability in the ophthalmology community. EyePoint Assist, the Company-sponsored program designed to ensure access to DEXYCU, is available for eligible patients in need of financial assistance. DEXYCU is the first long-acting intraocular steroid approved by the FDA for the treatment of postoperative inflammation. Cataract surgery is the most frequent surgical procedure in the U.S., with approximately 4.8 million performed annually. DEXYCU employs the Company’s Verisome sustained-release drug delivery technology to deliver a biodegradable extended-release formulation of the steroid dexamethasone into the posterior chamber of the eye via a single injection at the end of surgery, eliminating the burden of self-administering steroid eye drops up to four times a day for several weeks on a titrated schedule, in a primarily elderly patient population. Eric Donnenfeld, MD, FAAO is an internationally known eye surgeon. The Ophthalmologist has designated Dr. Donnenfeld as of the 50 most influential ophthalmologists in the world. Dr. Donnenfeld was one of the first surgeons in the world to do laser vision correction and was involved in the first studies that eventually led to the approval of the excimer laser. During a career spanning more than 20 years, Dr. Donnenfeld has successfully helped tens of thousands of patients achieve better vision, including more than 1,000 fellow eye doctors and their families. He is also an experienced corneal surgeon and has performed more than 2,500 corneal transplant procedures. Dr. Donnenfeld is routinely asked to help other eye surgeons advance their proficiency in refractive surgery and has trained more eye surgeons than any other ophthalmologist in New York. He has authored more than 200 papers on cornea, external disease, cataract and refractive surgery, 500 scientific articles, and 20 books and book chapters on a range of subjects pertaining to corneal transplants, cataract care and laser vision correction. Dr. Donnenfeld is a past president of the American Society of Cataract and Refractive Surgery and president elect of the international intraocular implant society. He is an author of the Refractive Surgery Basic Science Book for the American Academy of Ophthalmology. In addition, he is on the editorial board of nine medical journals and has lectured at medical schools and refractive surgery meetings both nationally and internationally. Dr. Donnenfeld is editor in chief of EyeWorld. Founded in 1997, Ophthalmic Consultants of Long Island (http://www.ocli.net) is one of the leading ophthalmology practices in the United States. OCLI boasts 19 state-of-the-art medical facilities across Manhattan, Nassau, and Suffolk counties, housing the most advanced technology available, to offer patients a variety of ophthalmic services and treatments. OCLI is led by 43 highly skilled eye surgeons in each major sub-specialty of eye care, providing comprehensive eye care services, including treatment for cataracts, corneal disease, refractive surgery, glaucoma, oculoplastics, retinal disease, and neuro-ophthalmology. OCLI also employs seven Doctors of Optometry, three Physician Assistants, and one NYS Licensed Aesthetician. Ophthalmic Consultants of Connecticut (OCC) is a premier eye care group offering an array of comprehensive vision correction procedures and treatments for a range of eye conditions and diseases with 4 locations across Connecticut. Widely recognized as a leading eye care practice in the community, OCC is staffed with highly experienced eye doctors and a superb medical team who strive to maintain the highest standards of medical and surgical care. Island Eye is a New York State licensed and Medicare Certified Ambulatory Surgery Center and Tissue Transplantation facility. The center is also accredited by the Accreditation Association for Ambulatory Health Care (AAAHC), a national nonprofit organization ensuring that ambulatory facilities maintain the highest standards of safety and medical care. Since the beginning, Island Eye Surgicenter’s mission has been to provide excellence in surgical eye care, and it remains a “Center of Excellence.” The physicians of Island Eye Surgicenter are some of the most prominent medical professionals in the nation. They contribute to the development of the latest ophthalmic advancements and lecture on a range of subjects pertaining to surgical eye care throughout the United States and the around world. Spectrum Vision Partners (http://www.spectrumvisionpartners.com) is a leading management services organization, serving the ophthalmology sector. Spectrum Vision Partners has over 750 employees, providing world-class practice management solutions to a network of nationally renowned, multi-specialty ophthalmologists in the New York, New Jersey, Connecticut Tri-State region. The Spectrum platform in New York and Connecticut consists of 23 clinic locations, two State Licensed Ambulatory Centers, over 50 surgeons, doctors, and other medical professionals. Spectrum Vision Partners provides a comprehensive set of business support functions, including billing and collections, credential services, marketing, physician recruitment, ASC development, financial and accounting services, benefits and payroll management, and information technology. The company’s corporate service center is located at 825 East Gate Boulevard, Suite 111, Garden City, NY 11530. EyePoint Pharmaceuticals, Inc. (formerly pSivida Corp.) (http://www.eyepointpharma.com), headquartered in Watertown, MA, is a specialty biopharmaceutical company committed to developing and commercializing innovative ophthalmic products in indications with high unmet medical need to help improve the lives of patients with serious eye disorders. With the approval by the FDA on October 12, 2018 of the YUTIQ™ three-year treatment of chronic non-infectious uveitis affecting the posterior segment of the eye, the Company has developed the majority of the FDA-approved sustained-release treatments for eye diseases. The most common adverse reactions reported for YUTIQ were cataract development and increases in intraocular pressure. DEXYCU™ was approved by the FDA on February 9, 2018. DEXYCU, administered as a single intraocular dose at the end of ocular surgery for the treatment of postoperative inflammation, is the first and only FDA-approved intraocular product with this indication. The most common adverse reactions reported by 5-15% of patients were intraocular pressure increased, corneal edema and iritis. DEXYCU employs the Verisome® extended-release drug delivery technology, which encompasses a broad number of related, but distinct drug delivery systems with the potential of incorporating an extensive range of active agents, including small molecules, proteins and monoclonal antibodies. ILUVIEN® (fluocinolone acetonide intravitreal implant), a micro-insert for diabetic macular edema, licensed to Alimera Sciences, Inc., is currently sold directly in the U.S. and several EU countries. Retisert® (fluocinolone acetonide intravitreal implant), for posterior uveitis, is licensed to and sold by Bausch & Lomb, Inc. and Vitrasert (ganciclovir implant), for cytomegalovirus retinitis was licensed and sold by Bausch and Lomb until being discontinued in 2013. The Company's development programs are focused on using its core Durasert™ and the Verisome platform technologies to deliver drugs to treat posterior segment uveitis (shorter-duration treatment), wet age-related macular degeneration, glaucoma, and other diseases. To learn more about the Company, please visit http://www.eyepointpharma.com and connect on Twitter, LinkedIn, Facebook and Google+. SAFE HARBOR STATEMENTS UNDER THE PRIVATE SECURITIES LITIGATION ACT OF 1995: Various statements made in this release are forward-looking, and are inherently subject to risks, uncertainties and potentially inaccurate assumptions. All statements that address activities, events or developments that we intend, expect, plan or believe may occur in the future, including but not limited to statements about our commercialization of YUTIQ and DEXYCU, the expected timing of release of the 24-month and 36-month patient follow-up data for YUTIQ and our expectations regarding the timing of a filing of an application for approval of a next-generation, shorter-duration treatment for posterior segment uveitis, are forward-looking statements. Some of the factors that could cause actual results to differ materially from the anticipated results or other expectations expressed, anticipated or implied in our forward-looking statements include uncertainties with respect to: our ability to achieve profitable operations and access to needed capital; fluctuations in our operating results; our ability to successfully produce commercial supply of YUTIQ and DEXYCU and commercialize YUTIQ and DEXYCU in the U.S.; our ability to successfully build a commercial infrastructure and enter into and maintain commercial agreements for the launch of DEXYCU and YUTIQ; the successful release of our YUTIQ line extension shorter-acting treatment for uveitis; potential off-label sales of ILUVIEN for non-infectious posterior segment uveitis (“NIPU”); consequences of fluocinolone acetonide side effects; successful commercialization of, and receipt of revenues from, ILUVIEN for diabetic macular edema (“DME”) which depends on the ability of Alimera Sciences, Inc. (“Alimera”) to continue as a going concern; Alimera’s ability to obtain additional marketing approvals and the effect of pricing and reimbursement decisions on sales of ILUVIEN for DME; Alimera’s ability to obtain marketing approval for ILUVIEN in its licensed territories for NIPU; potential declines in Retisert royalties; our ability to market and sell products; the success of current and future license agreements, including our agreement with Alimera; termination or breach of current license agreements, including our agreement with Alimera; our dependence on contract research organizations, contract sales organizations, vendors and investigators; effects of competition and other developments affecting sales of products; market acceptance of products; effects of guidelines, recommendations and studies; protection of intellectual property and avoiding intellectual property infringement; retention of key personnel; product liability; industry consolidation; compliance with environmental laws; manufacturing risks; risks and costs of international business operations; effects of the potential exit of the United Kingdom from the European Union; legislative or regulatory changes; volatility of stock price; possible dilution; absence of dividends; and other factors described in our filings with the Securities and Exchange Commission. You should read and interpret any forward-looking statements in light of these risks. Should known or unknown risks materialize, or should underlying assumptions prove inaccurate, actual results could differ materially from past results and those anticipated, estimated or projected in the forward-looking statements. You should bear this in mind as you consider any forward-looking statements. Our forward-looking statements speak only as of the dates on which they are made. We do not undertake any obligation to publicly update or revise our forward-looking statements even if experience or future changes makes it clear that any projected results expressed or implied in such statements will not be realized.